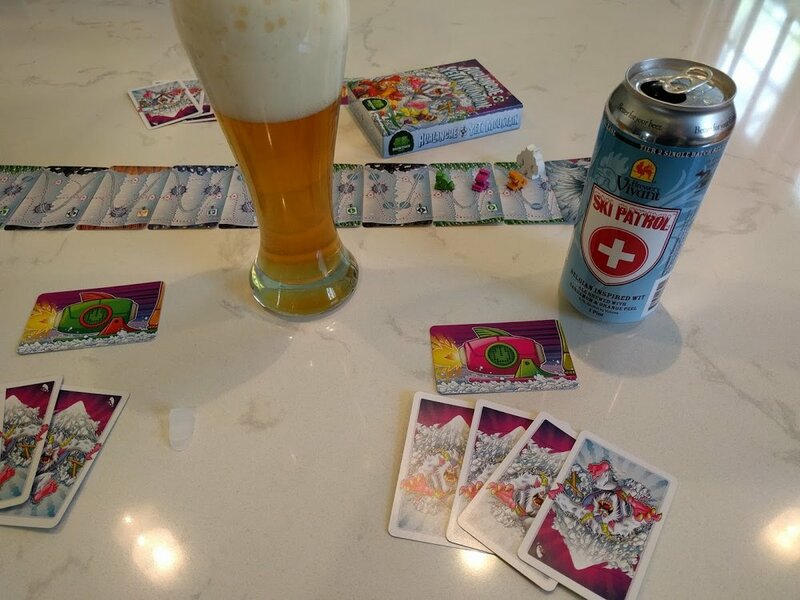 Serendipitously, I came across the new board game Avalanche at Yeti Mountain online while enjoying a Belgian inspired Wit from Brewery Vivant called Ski Patrol. At that moment, I knew I would have to pair the two together. The game was not yet available so I bought an additional four pack of Ski Patrol and stored it in the beer fridge until my copy of Avalanche at Yeti Mountain arrived. This past weekend I finally had the opportunity to pair them together, and I can safely say is it was a hit! First I'll describe the game. If you’re looking for a board game to fulfill your rocket-powered skiing weekend fantasy, Avalanche at Yeti Mountain has you covered. This quick racing game is easy to learn and provides a nice break from any brain burning strategy board game. In my plays (solo to 3 players) the game averaged just under 10 minutes of play time. I would recommend this game if you are looking for a short filler on game night or a travel game. It is flexible enough to be played solo or with a medium sized group (i.e. 5 players). Now on to the beer. Ski Patrol is a Belgian Witber that pours a hazy sunburst orange color with a large bright just off white head that quickly dissipates. The aroma is faintly orange with just a hint of spice cake. The taste was surprisingly more spicy than the smell. I believe this spiciness was greatly helped by the ample carbonation which was a nice complement to the medium body and creamy mouthfeel. Overall this beer is easy to drink and a nice reminder of the winter months past. Avalanche at Yeti Mountain should be available in your local game store over the coming weeks. Ski Patrol can still be found it at many local Michigan retailers that specialize in adult beverages. If you don’t live in Michigan or are seeking an alternative that is similar in style, you could try one of the following or write in your favorite in the comments below.